It's coming..."Fat Tuesday" which means the diet starts on Ash Wednesday! But before Wednesday are the parades, the costumes, the throwing of beads. 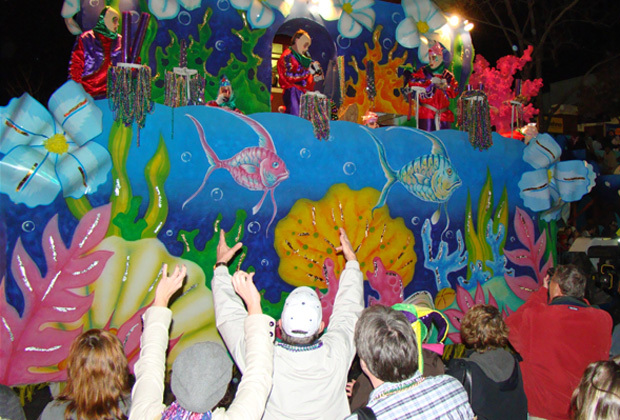 Each of the towns in Central Louisiana celebrate with parades. Some of them are put on by civic organization, others by the towns, themselves. Floats are rented, and the last I heard they were about seven hundred dollars, up to three thousand for a day. Yikes! For most organizations in small towns, they do their own floats and keep them every year or do a new design for that year. People on the float might be in costume, or not. There will be a lot of people on the sidelines watching the parade. Those in small towns will set up lawn chairs, ice chests, of course bring something to bring their booty home. The major part of the floats is throwing out beads, plastic cups, candy, candy, and more candy. You can see what's happening here...the crowd will be changing 'Throw me something Mister!" The thrill and excitement only lasts for a few moments while the parade passes. But that is Mardi Gras in a small town. Or as the natives say it, "Laissez les bon temp roulet."